These two guys to the left? That's Martin and Anthony Brodeur. Anthony grew up idolizing his father, becoming a goaltender himself. While he wasn't one of the top skaters as ranked by the Central Scouting Agency, there was hope that young Anthony may follow in his father's footsteps. When the seventh round of the draft happened upon us, things looked grim in that Anthony may not get his name called. But the Devils and Kings did a classy thing as the Devils traded for Los Angeles' last pick - 208th overall - and used it to select Anthony Brodeur! Pretty cool moment, right? 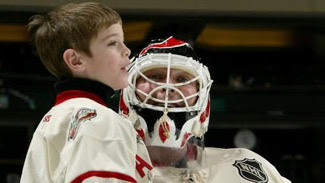 You could certainly see that Martin Brodeur was proud to call his son's name at the NHL Entry Draft, and having Anthony's father call his name in front of the fans who have watched Anthony grow up had to be special as well. The best part? If this is indeed Martin Brodeur's last season in the NHL, there's a good chance that Anthony Brodeur will be able to watch his father's final game from the bench. In uniform. And join him post-game on the ice as a member of the New Jersey Devils. Now that's something very few people on this planet can say they have done. The theme of family ran deep today as former NBA star Popeye Jones saw his son, Seth, drafted fourth overall by the Nashville Predators. Darnell Nurse, son of former CFL player Richard Nurse and nephew of former NFL player Donovan McNabb, was selected seventh overall by the Edmonton Oilers. All the players had friends and family in the stands who congratulated when their names were called. But only one son had his father call his name over the arena loudspeakers. I'm not one for touching, sappy moments, but the Brodeurs and the Devils made the 2013 NHL Entry Draft in Newark, New Jersey something special. With the NHL Entry Draft upon us tomorrow, many teams are staring at the salary cap ceiling and looking to move assets. Twitter was abuzz with rumors about players moving from one team to the next, but no actual trades had been made. In other words, there was a lot of tire-kicking, but we're still waiting for the floodgates to open. In any case, Vancouver's goaltending situation sounds like it may get resolved this weekend, but not how you may expect. Vancouver GM is apparently fielding a lot of calls regarding Cory Schneider as opposed to Roberto Luongo, and he seems to be taking these calls seriously as he looks to move one of his two highly-paid goalies. Edmonton reportedly was "very interested" in Schneider, so this appears to be the direction that Vancouver may go if they need that cap room relief. You may be saying to yourself how dumb Gillis is for even considering this move now as opposed to making a deal a long time ago in moving Schneider. I would agree with you wholeheartedly as I've always believed that Schneider was the move movable asset when you consider his age and contract. He'd be the more attractive of the two goalies for teams looking to trade with Vancouver based on those factors alone. But that's also one of the reasons why Vancouver wanted to keep him - he has a very manageable contract, and he's still improving. He's already a solid goaltender, playing lots of minutes this season, so you know you're trading for an excellent asset if you were able to pry Schneider away from the Canucks. 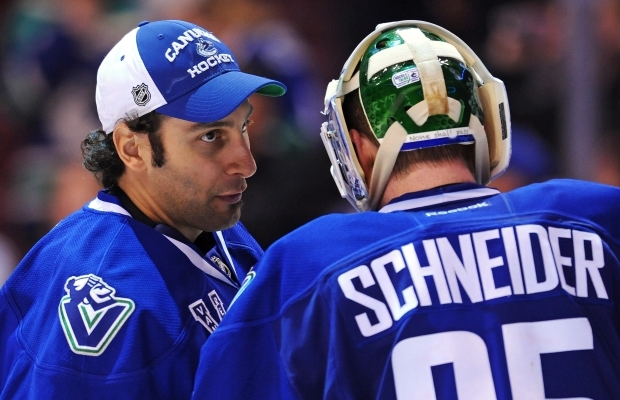 My concern for the Canucks now is that if they do trade Schneider, what do you do with Roberto Luongo? Of course he'll play - he's still under contract for the next 300 years - but the relationship between him and Mike Gillis may never be repaired. I fully expect Luongo to be professional about playing if he is once again the starter for the Canucks, but I can't see him ever warming up to Mike Gillis ever again after what he's been through over the last year. Either way, assets are up for grabs on the Canadian left coast. Other names mentioned yesterday? Reportedly, Philadelphia is trying to move defenceman Brayden Coburn. Minnesota has been fielding calls on a few players, including fan favorite and hit machine Cal Clutterbuck. Kris Letang may be available for the right price via trade as his camp and Ray Shero are still trying to find common ground in their contract extension talks. Mike Cammalleri's time in Calgary appears to be up as Jay Feaster is looking for a trade partner. And for some strange reason, St. Louis wants to swap David Perron out of town. Lots of players are in play as the NHL Entry Draft approaches, and it appears that many can be had if the price is right. The only question GMs have to ask themselves is whether or not they are spending wisely or overspending to take on these players. After all, with the cap going down, you don't want to take on a massive contract by giving up a ton of young players and picks if you aren't going to see your team take steps forward. So what do GMs do if they have some cap space and can swing a deal for an established veteran? That is the $64 million question this weekend. There are certain pairs of individuals that have a lasting impression on the world of sports. Whether it be Stockton-Malone for so many years in Utah, Gretzky-Lemieux at the Canada Cup, or McGwire-Canseco as the Bash Brothers in Oakland, some tandems are too good to be broken up. 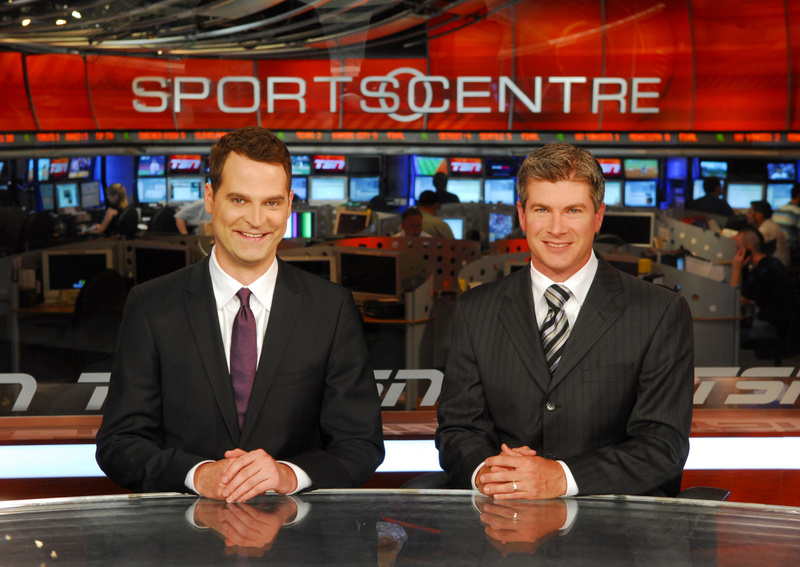 Such is the case with TSN Sportscenter anchors Jay Onrait and Dan O'Toole. If you haven't seen these guys talk about sports, you're missing out. The only problem? They won't be doing in Canada after tonight. Jay Onrait and Dan O'Toole have accepted a job in Los Angeles with the new Fox Sports 1 channel, and they will bring their brand of comedy as sports anchors to the station starting on August 17. Longtime behind-the-scenes producer Tim Moriarty, aka "Producer Tim", will join the duo in Los Angeles as Fox Sports paid the three handsomely to bring their schtick to American network sports. Honestly, the loss of Onrait, O'Toole, and Moriarty will leave a void in this writer's sports highlight-watching life. While I fully respect the talent TSN has, these two have made the late-night Sportscenter hour into a sports-themed comedy show. It feels like you're watching two friends talk about all the sports that happened throughout the day, complete with sound effects, props, and all the jokes one can handle. It's this aspect I'll miss the most. While I'll still be able to listen to their podcast, losing them to Fox Sports, the highest bidder, seems almost New York Yankee-like. It just doesn't feel right, but I fully and completely respect their decision because you'd have to be insane to turn down the reported $300,000-$500,000 each of the three men will be receiving to host the new Fox Sports highlight show. Well done, gents. Heckuva pay day! Here now are some of the highlights of their time on TSN. Honestly, these guys are extremely talented, and I wish them the best of luck as they move forward with their careers in Los Angeles. Be prepared, America, because the Onrait-O'Toole tandem will change your lives forever! Jay and Dan examine their Movember moustaches. Jay's photo shoot announcement is ruined. Dan's neck got fatter on the weekend. Jay and Dan... wait for it... DANCE! Jay and Dan received Schtickys! Jay's favorite NHL goaltender package: BOBROVSKY! Honestly, TSN just won't be the same without these two and their nightly hilarious antics that have drawn viewers in since they were paired as the late-night hosts. Best of the luck, gents, and I'm sure Canadian TV hasn't seen the last of you two! The Hockey Show's hosts - Teebz and Beans - have been discussing the Colorado Avalanche's insistence on telling everyone that they are going draft Nathan MacKinnon come hell or high water. Honestly, it's a little baffling considering the state of their blueline, but I'm neither Joe Sakic nor Patrick Roy, so I don't get the luxury of making that decision. But it does leave us, as fans, baffled as to why the Avalanche won't fill a glaring need with a player of Seth Jones' caliber. So we went to one of the best sources for Colorado Avalanche info that we knew of in a man they call "Tapeleg". James Gralian is a great blogger who writes about the Avalanche, and I have known him for many years through his blog Jerseys and Hockey Love. Honestly, the man is connected within the Avalanche community and knows a pile about hockey in general. In short, he's the kind of guy we love to chat with because he tells it like it is about the best game on the planet. We'll be quizzing James on why the Avalanche seemingly have shown their cards long before arriving in New Jersey, and why they insist on drafting a forward when they clearly need to upgrade their blueline. We'll ask him about the recent hiring of Patrick Roy and his impact on the franchise, the hiring of Adam Foote and force him to adopt a stupid title, and the promotion of Craig Billington from farm team overseer to Patrick Roy's handler for management. It should be an entertaining show, so please tune in at 5:30pm CT on 101.5 UMFM! Feel free to tweet me any questions you may have for James about the Avalanche at my Twitter account @TeebzHBIC. And if you're on Twitter anyway, you might as well go ahead and follow James as well on his account @Tapeleg! Looking forward to chatting with James about all this and more tonight on The Hockey Show! After spending some extensive time looking over the point totals for the HBIC Playoff Pool, it dawned on me that there are some extremely talented prognosticators in this group of entrants. Officially, two men will stand out from the rest, but you should all feel pretty darn good about yourselves. This was, by far, one of the most unpredictable playoff years in recent memory, so know that I think this may have been the best group yet. This will show in the final standings posted below when you see how closely everyone finished. I'll start first with a correction. I shorted Greg C. two points along the way. Thanks to the hired auditing team of Dewey, Cheetham and Howe, this mistake was found and corrected, boosting Greg's point total by a deuce before this round even began. Good eyes on that Greg, and thanks for calling me on the shorting! Ok, so I was going to post the best score, but then it dawned on me that the two people who broke double-digit point totals in this round actually finished on the prize list. Therefore, I'll run down how the nine prize winners did to finish off the 2013 HBIC Playoff Pool. And this will go in order from ninth to first. Here we go! 9. Christopher C. - 77 points: Chris added five points to his total in the Stanley Cup Final. He could have technically finished higher had he picked a tie-breaker team way back before this whole dance started, but he still made the cut, finishing with a prize. Well done, Chris! 8. Brandee T. - 77 points: Brandee also added five points, keeping pace with Chris. If there was one person who insisted on flaunting the rules of the playoff pool, though, it was Brandee. Brandee always submitted picks on time, but I soon found out that Brandee is a Mac user as I kept receiving spreadsheets in .numbers format! Honestly, help a brother out here! In all seriousness, well done on your pool picks, Brandee! 7. Michael J. - 77 points: They say that a strong finish can mean a lot, and it did in this case. Michael went crazy with 13 points in the Stanley Cup Final! He called every game correctly for six points, added Patrick Kane's game-winner in Game Five for another two points, and called Chicago to win the Stanley Cup in six games! And to add a little more salt to the wound, Michael also called Pittsburgh to be his tie-breaker team, finishing well ahead of Brandee's team in Montreal! Well done, Michael, on being this round's best performer, and for jumping into the prizes with those predictions! 6. Thomas O. - 78 points: Thomas only grabbed three points in the Stanley Cup Final, but they helped him earn his prize. Thomas was at or near the top of the leaderboard for the entire playoffs, and i pays off in the end with a prize! Well done, Thomas! 5. John M. - 79 points: John used a six-point Stanley Cup Final to vault up the standings. He was actually tied with Ty F. after the last round, but apparently I omitted him from the standings to make it appear like he came out of nowhere. That was not the case as I went back and did the math, and John finished with his 79 points earned! Well done, John! 4. Westin F. - 79 points: Westin finished the Stanley Cup Final with five points to push him into a tie for fourth-place. However, Westin held onto the fourth-place spot after picking Boston as his tie-breaker team, relegating John to fifth-place as Boston out-penaltied Vancouver fairly easily. Well done, Westin, on a successful playoff run! 3. Tyler J. - 80 points: Tyler, who was in eleventh-place at the end of Round Three, used a nine-point Stanley Cup Final to launch himself into third-place at the final standing! He called four games right and picked Chicago in six games for those nine points, and that boost rocketed him up the leaderboard! Well done on your Stanley Cup Final picks, Tyler, and congrats on the playoff predictions! 2. George C. - 90 points: George was the other peak performer in the Stanley Cup Final as his picks earned him 11 points! George called every game correctly, and knew that Chicago was going to win in six games. With those eleven points, George put some serious pressure on Andy to come through with his picks. Well done, George, on a successful playoff pool! 1. Andy S. - 95 points: Andy pretty much controlled this pool from the opening round right through to the finish. He had 56 points through Round One, and used some smart picks through the next three rounds to keep him ahead of both Thomas and George the rest of the way. Andy earned seven points in the Stanley Cup which was enough for him to win the 2013 HBIC Playoff Pool! Congratulations, Andy, on your excellent prognostications! It's a holiday weekend in Canada and Independence Day in the US next week, so I've decided that I will begin mailing these packages after Canada Day. I will start sending out emails this weekend to the winners, so keep your eyes on your inbox. If you haven't taken a look at the prizing yet, I'd suggest you do so. All in all, thank you to everyone who partook in this year's HBIC Playoff Pool. We'll get at this again next year, and hopefully you'll all be back to try to call the games as best as you can. I'm not sure what everyone else was doing tonight, but I had my first official meeting tonight as a Member of the Board for the UMFM radio station. 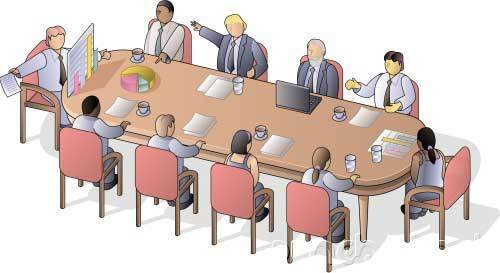 I know - how the heck did they let Teebz onto the Board of anything? I asked myself the same question, but it actually was pretty interesting and I feel confident in this group's collective abilities in making the station bigger and better than what it currently is. That being said, there's another guy on this planet who officially became the Chairman of the Bored today as the Philadelphia Flyers finally did what was expected in cutting Ilya Bryzgalov loose. If anyone had told me that I could receive $23 million not to work for someone by simply performing poorly at my job, I would have given a much better effort at becoming a professional athlete. 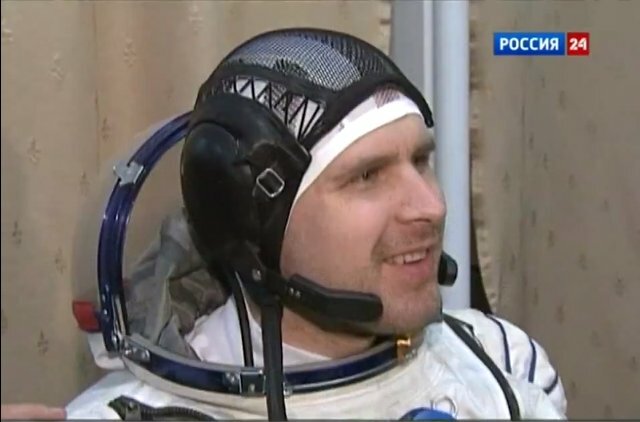 Ilya Bryzgalov's payout to the tune of $23 million will now allow him to seek employment elsewhere outside the city of Brotherly Love. Expect the phones of GMs in Russia to begin ringing once he is officially bought out tomorrow. For everything that Bryzgalov said about not being involved in the business side of the game, it's pretty crazy to think that he basically ended his NHL career through his rantings about the "humongous big" universe on HBO and through some rather horrendous play in the Philly nets. If that doesn't really make him wake up and smell the roses, I'm not sure what will in terms of cluing him in to the business side of the game. In his two seasons with the Flyers, Bryzgalov put together a 52-33-10 record - decent in terms of a 54.7% winning percentage. He was over .500 in both seasons, but his record deceives as his undoing were the other numbers. His 2.61 GAA wasn't very good, and his .905 save percentage left something to be desired. When it really mattered in the playoffs, Bryzgalov's GAA ballooned to 3.46. Clearly, the bloated contract that the Flyers gave him was based on past performance that he could not and was not able to reproduce. So now the Flyers will pay Bryzgalov not to play for them to the tune of $23 million over the next 14 years. He'll be 47 when payments stop. That's a pretty sweet severance package for not doing your job very well. And it's not like any other team is desperate enough to bring him into camp to compete for a job after watching his play and interviews over the last few years. In fact, outside of a few KHL teams, I can't see him finding a job anywhere on the planet in hockey after some of his outrageous comments and his insanely frustrating netminding. I guess if he's really looking for a job, there's always hope that he could be the next great cosmonaut in the path of Yuri Gagarin. After all, that "humongous big" universe still needs a great deal of exploration done. Until next time, смело идти туда, где никто не бывал! Again, someone had to lose. The Chicago Blackhawks appeared to be that team in tonight's Game Six, trailing 2-1 with 1:30 to go. It appeared the Madhouse on Madison would get one more game to determine a winner between the Chicago Blackhawks and the Boston Bruins in this thrilling series. That is, until Bryan Bickell decided he wanted overtime. And so it seemed we'd have a fourth game go into overtime between the Bruins and Blackhawks. It would be fitting that this game would end in overtime considering how close this series has been contested. That is, until David Bolland, just 17 seconds after Bickell wanted overtime, said, "Not on my watch." And with the 3-2 lead, the Blackhawks exhausted the clock and the celebration began! 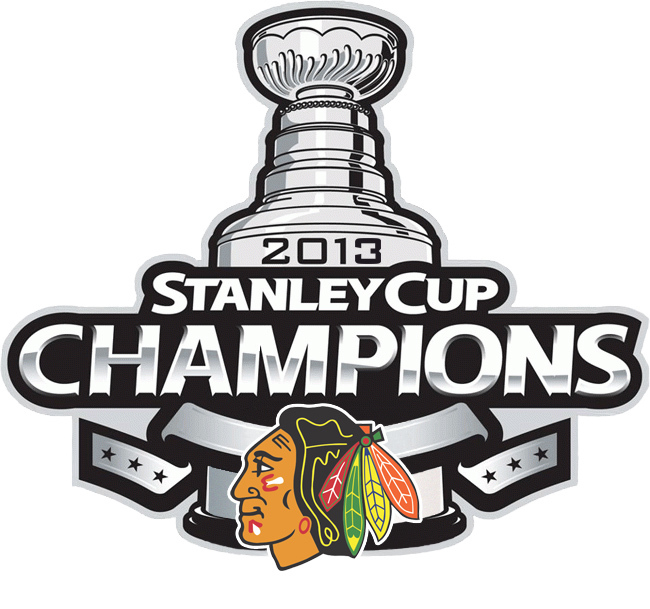 The Chicaho Blackhawks are your wire-to-wire NHL Champions as they captured the Stanley Cup! While many were leaning towards Cory Crawford being the Conn Smythe Trophy, the success of Americans as the playoff MVP continued as Patrick Kane was called to accept the Conn Smythe Trophy. He follows fellow Americans Tim Thomas and Jonathan Quick, and makes it four American winners in the trophy's history as Brian Leetch captured it in 1994. 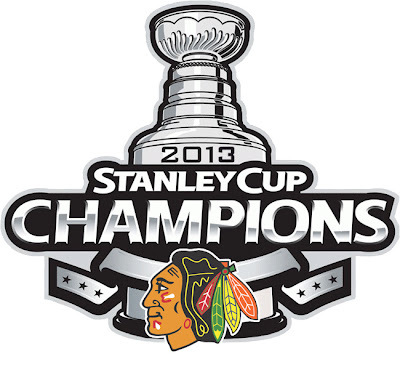 Congratulations go out to the Chicago Blackhawks, your 2013 Stanley Cup Champions! In a rather unsurprising move, Maple Leafs GM Dave Nonis traded for a goaltender who he feels can be Toronto's starting goaltender. The only thing that was unexpected is that it wasn't Roberto Luongo. Instead, Nonis swapped Matt Frattin, Ben Scrivens, and Toronto's second round pick in either the 2014 or 2015 NHL Draft for Los Angeles backup netminder Jonathan Bernier. I'm not sure why Nonis felt this move would strengthen the club, but he now has two young goaltenders who can compete for the starting job. Or, in layman's terms, he has exactly what he had last year minus Matt Frattin and a draft pick. Look, there was no denying that the Leafs have been kicking tires on starting goaltenders around the league for a while. Nonis and Burke both flirted with the Vancouver Canucks regarding Roberto Luongo, and neither man really said they weren't interested when asked if there was interest in Luongo. But in trading for Jonathan Bernier, the Leafs now have two young goaltenders who will compete for the blue paint this season. While I appreciate competition bringing out the best in both Bernier and Jamer Reimer, the truth is that one will sit more than the other. Neither will publicly say it, but neither will be overly happy in the backup role on the bench. It's rather hard to believe that in January, Dave Nonis is quoted as saying, "The only issue I would have with our goaltending would be experience. It’s not that they’re not quality goalies." Here we stand today with Reimer having nearly knocked off the Boston Bruins in their series while Jonathan Bernier has virtually zero experience while playing as Jonathan Quick's backup. 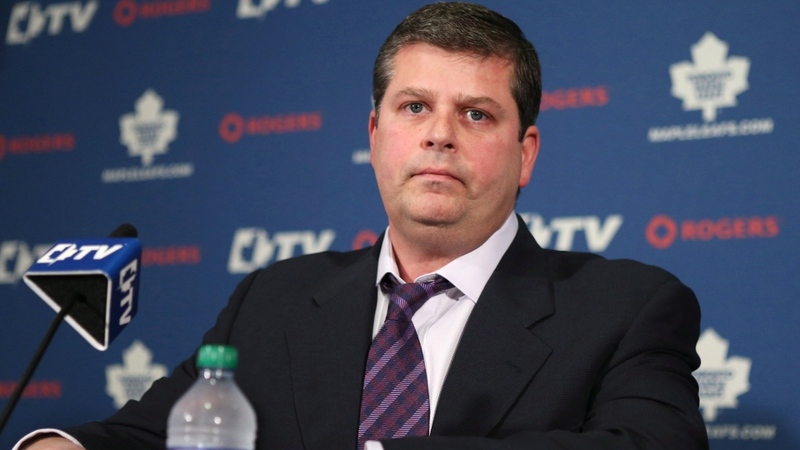 On April 20, 2013, Nonis told The National Post's Sean Fitz-Gerald, "Reims always knew — because we were up front with him — that he was never going anywhere. It was always about adding some depth to the organization. He was going to be our goaltender." So what happened between April 21 and now that has Nonis acquiring a guy who has been outspoken about his desire to be a starting goaltender in the NHL? Why was this move necessary when Reimer and Scrivens were clearly doing more than anyone had in the last decade while tending Toronto's net? I completely understand the notion that Nonis wanted some depth for the goaltending position when it came to acquiring an older goaltender such as Miikka Kiprusoff from the Flames. Reimer could learn from the veteran goaltender, and the Leafs had a veteran goaltender to rely upon in case Reimer faltered in the playoffs much in the same style that Pittsburgh used Fleury and Vokoun. But getting a guy like Bernier doesn't add depth as much as it adds competition. Again, competition can be good, but what if Bernier loses out to Reimer? Are we going to see the same pouting that was done in Los Angeles when he didn't get the minutes he thought he should be getting? If Bernier comes in with that attitude, it sounds like he's accepting the challenge of knocking James Reimer out of the starting position. That sentiment was expressed by Nonis at the press conference today when he stated that, "Nothing's being guaranteed to anybody." It sounds like the job is up for grabs as far as Nonis is concerned, and that "I don't think you can be deep enough at that position. We got younger and deeper today and we feel our team is stronger because of it." While Nonis has yet to reach Reimer, the Leafs officially have a battle for the starting goaltending position already and we haven't even made it to the draft. While Bernier is a restricted free agent right now, it sounds as though the Leafs will sign him, thrusting Reimer and Bernier into a battle for minutes in the blue paint. Personally, I thought Reimer had done enough in the playoffs to have the starting goaltender title given to him, but Dave Nonis clearly had other ideas about the position as a whole in shipping out Scrivens for Bernier. While I can't see Bernier complaining about his role in Toronto - either starting or backing up Reimer - because there will be opportunities for increased minutes as compared to what he had in Los Angeles, Randy Carlyle and Dave Nonis will have actively manage the minutes both are playing to keep both happy. I'm not saying Bernier's apt to rock the boat in Toronto, but he certainly was vocal about his lack of playing time behind one of the planet's best netminders. In other news surrounding the goaltending carousel that appears to be starting up, the Minnesota Wild are reportedly exploring the market by asking about Pittsburgh's Marc-Andre Fleury. With Niklas Backstrom expected to ask for an increase to his $6 million cap hit in St. Paul, it appears Wild GM Chuck Fletcher might be looking at less expensive options. While Fleury was given a vote of confidence by Penguins GM Ray Shero as next year's starting goaltender, you have to wonder if Shero would consider trading Fleury after failing yet again in the spring. The Wild have a plethora of prospects, and the Penguins gave up a pile of prospects and picks at the deadline to stock their roster. With Vokoun signed for another season, Shero has a stop-gap to ensure that one of Jeff Zatkoff or Brad Thiessen is ready to make the next step. There are also a number of goaltenders on the free agent market that could fill in Fleury's locker nicely. Mike Smith and Ray Emery are both UFAs this summer, and there could be a nice pay day for, say, Smith if he were to don Penguins colors. In any case, the idea of trading Fleury may not be a popular one, but it could rid Pittsburgh of a problem that has plagued their playoff runs over the last few years. And then he becomes Minnesota's playoff problem. If this NHL Stanley Cup Final hasn't delivered in every way possible yet, I'm not sure what you're looking for in terms of a hockey game. Great saves, big goals, massive hits, and many overtime periods are just some of the highlights seen in this series. Add the facts that these are two Original Six teams and both were at or near the top of their conferences' respective standings, and you have yourself a Stanley Cup Final that will rival any over the last two decades in terms of the entertainment value. While it seemed that both teams were willing to do whatever it took to go up 3-2 in the series, the Blackhawks, powered by a pair of Patrick Kane goals, are now one win away from a Stanley Cup. There were some notable losses aside from Boston losing the game, though, as both Jonathan Toews and Patrice Bergeron didn't play in the third period at all. Are there significant injuries? Toews did sit on the Chicago bench for the third period after taking a massive hit from Johnny Boychuk - see above - but Bergeron left the United Center in an ambulance under his own power. If either of these players are gone from the series, it could swing momentum in a big way. While it appeared that no one from the Blackhawks had yet to step up and grab hold of the Conn Smythe Trophy yet, I now believe that Patrick Kane is the man who will hoist that trophy over his head if the Blackhawks indeed win. Kane has been on fire in his last two games especially, notching three goals and an assist. He has seven goals in his last seven playoff games. He's seen his points total increase to 19, second-best in the playoffs only to Boston's Devid Krejci. While Crawford could still garner enough votes, that glove hand of his may sway voters to look at Kane's offence as the reason for Chicago winning. I'm one of this inclined to believe that thought. If nothing else, the final five minutes of tonight's game were the reason to love hockey. Two teams who are evenly-matched went up and down the ice playing firewagon hockey. There were shots, saves, transitions, and hits, and all of it came while the Bruins were pressing for the equalizer. Honestly, if watching the game tonight didn't get you excited about hockey, you might be dead. I'd have your pulse checked by someone immediately. The one guy who needs to break out if this series is to go seven games? Jaromir Jagr. It's been 21 years since Jagr played in a Stanley Cup Final, and we're now 21 years and counting since he scored in one. He has yet to dent the twine in this series, missing on a glorious chance last night when Crawford stoned him cold. And the clock keeps ticking for Jagr as these Stanley Cup Final games near the end. While Jagr has certainly been a force along the boards and magical at threading the needle on nearly impossible passes, goals continue to elude him. He's the one guy who could push the Bruins past the Blackhawks if he could only find the back of the net. Monday night sees the series shift back to Boston for Game Six. With their backs against the wall, will Boston answer back and force a winner-takes-all Game Seven in Chicago? Or will the Blackhawks win hockey's greatest prize with their third-straight win in this series? We'll know all on Monday night. It's been a long day for me as our Calgary office is officially underwater and without power. Those who can work from home are encouraged to, and those who cannot are trying to stay high and dry as the flood waters invade Calgary. I listened to several co-workers feverishly try to locate friends and family they have in the flood-affected Alberta region, many relieved to hear the sound of their loved ones' voices once they made contact. Needless to say, it's been a long day trying to support everyone during this crisis in Alberta. To anyone affected by the flood, I wish nothing but safety for you and your loved ones in this emergency. The weather doesn't appear to be letting up today, so here's hoping that Saturday brings some sunshine and a chance to start drying out homes and workplaces. If you haven't heard, the rumor coming out of Calgary is that the water is up to the tenth row of seats in the Saddledome right now. Dressing rooms officially are underwater, meaning they are a total loss once the water recedes. The Jumbotron, currently resting at ice level, is useless as the water has ruined it as well. 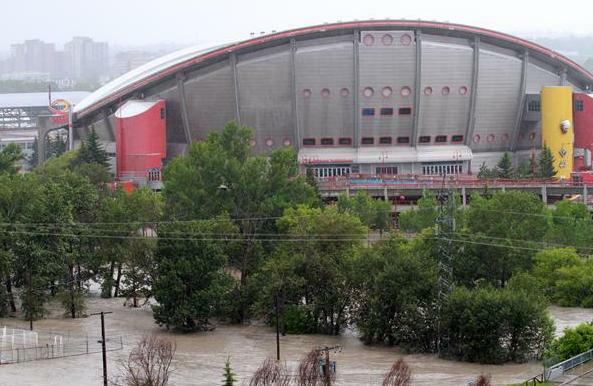 The Flames and WHL's Calgary Hitmen will have some serious work to do once the flood is over, and I hope that they can put things back together in time for the 2013-14 season. To everyone, put the cities of Calgary, Canmore, and High River in your thoughts and prayers tonight. It's a scary time there, and I wish nothing but the best for anyone affected or anyone who has loved ones affected. Mother Nature hammered away on Oklahoma City and Calgary - two hockey hotbeds - and it will take some time for these two cities to make things normal once more. Keep them in your thoughts. Until next time, stay safe and stay dry! I know I've reminded everyone a pile of times, but I'll do it again here tonight. The Hockey Show now starts at 5:30pm CT, so set your clocks accordingly! Honestly, having both Jared Aulin on the show about a month back and having Brandon and Jessica Reid on the show last week has made for some great programming lately, and we'll be bringing more guests aboard in the coming weeks! Of course, we're always grateful for everyone that tunes in, and tonight we want to thank the younger fans with some prizes! Beans and I will be discussing a pile of topics tonight. From recent signings to coaching changes to potential player buyouts, we'll look at all the movement around the NHL. We'll also look at the Stanley Cup Final, knotted at two games apiece, and discuss who we think will prevail as well as who our Conn Smythe Trophy winners are. 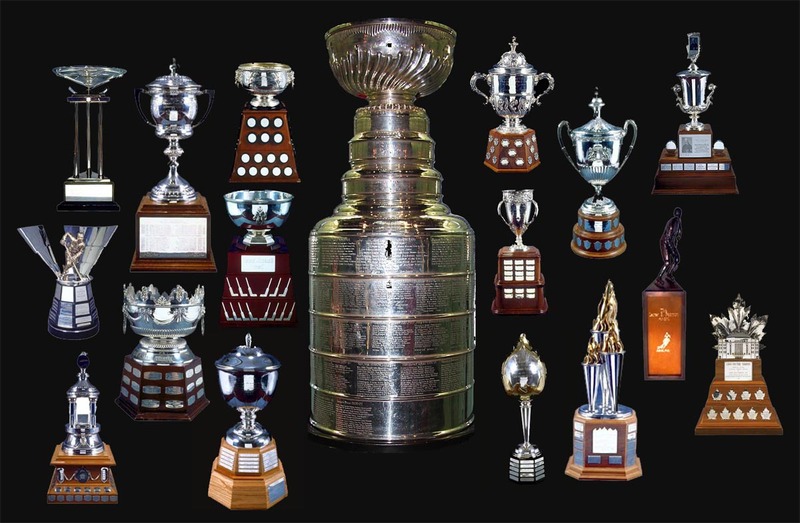 We'll also chat about the other NHL Award winners recently announced, and who was deserving and not so deserving. Finally, we'll touch on the AHL's Calder Cup champions in the Grand Rapids Griffins and how their success should help the Red Wings! Of course, we'll also take some calls as we announce prizing, but we're looking for the next generation of kids. We have a few t-shirts to give away, so anyone who is 12 and under should call in to talk hockey! Call us at (204) 269-UMFM (8636), and we'll see about getting you a t-shirt! How cool is that? As always, we'll take your tweets through my Twitter feed @TeebzHBIC as well! Lots of topics tonight on The Hockey Show, so tune in at 5:30pm CT on 101.5 UMFM! 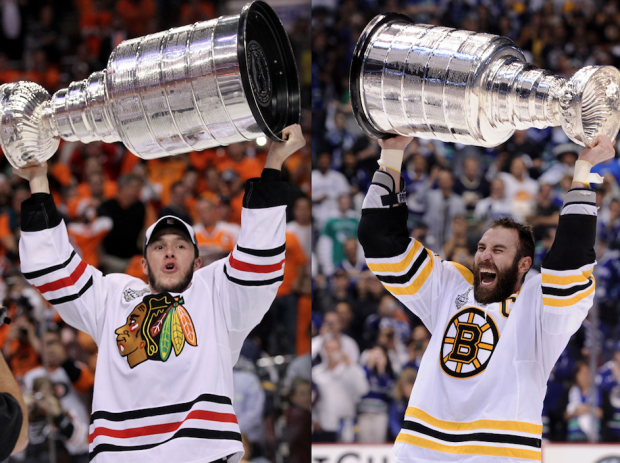 Four games are done, and we're all even as the Blackhawks and Bruins battle in their seemingly even series. Three games have gone to overtime, and the Blackhawks have won two of them including tonight's 6-5 explosion in goals. While there was chatter about the goalies being Conn Smythe favorites, there may be a case against both of them as pucks found their way behind them tonight in rather inexplicable ways. Sure, deflections make it hard, but there were some eyebrow-raising, "shoulda had it" goals tonight. If you were out and about, here are all eleven goals scored tonight. Some things to key on and watch for? Corey Crawford's glove hand, specifically up high, and Zdeno Chara being on the ice for five of Chicago's six goals. Yikes. So we head back to Chicago for Game Five with the series tied 2-2 after tonight's outburst of goals. Boston will need to win at least one game on the road if it hopes to capture the Stanley Cup as they'll visit the Madhouse on Madison at least once on the next three games. As thought, this series is turning out to be everything a hockey fan could hope for! The only problem? It has to end! Some of you may be visiting Hockey Blog In Canada this week to see the point total updates for the HBIC Playoff Pool. Unfortunately, you won't find any updates now until the end of the Stanley Cup Final. Why, you ask? Well, with only one series going, it makes the updates kind of anti-climactic. After all, you probably know how well you're doing yourself, so I'm not going to remove any sort of drama by posting the scores. Will Andy hold on? Will Tyler J. make it into the prizes? Only time will tell! In saying this, I do have a proposal to all readers out there. I always like to occupy myself in the summer, after hockey is over, with a project of some sort. I've covered NHLPA charities, I've done a pile of reading, and an assortment of other things, but I'd like your input, readers. Are there stories or things you'd like to see me work on this summer? Are there historical pieces you wish me to investigate further? Basically, I'm open to all ideas. I have a few ideas, but I'd like your perspective readers. I know that this summer will still have the NHL Entry Draft and all the crazy free agency deals that will be coming, but I'll pick a day where I'll run this project series, and we'll go from there. All I need from you are ideas! So fire away either here or via email, and we'll get this summer rocking! The "Hockey In Musicians" article/database of photos I have been compiling is growing. I still want any and all you may find, so feel free to hit me up via email with links and images! This is turning into a nice little project on its own, and I can't thank those who have submitted photos enough. Awesome job! Let's keep this going! If you missed last week's episode of The Hockey Show, please go to the podcast page on the right on download the interview with Brandon Reid and Jessica Scott-Reid. These two are at the top of the list in terms of guests we've interviewed this year, and Beans and I are pumped for more guests like this couple. Listen to it, and leave your comments for us! Next week's edition of The Hockey Show will feature a Colorado Avalanche blogger who is affectionately known as "Tapeleg". You don't want to miss this one as we talk about the Avalanche's draft strategy, the hiring of Patrick Roy, the tandem of Sakic and Roy running the show, and many more Avalanche-related chatter. Should be a beauty! This week's show will be previewed on Thursday as usual, but if you have kids and you want to see them win something cool on the radio, tune in! We have a few kids-sized prizes to hand out, and we want the kids involved as we give away a few items. More on this on Thursday! That's what's happening around these parts on HBIC. 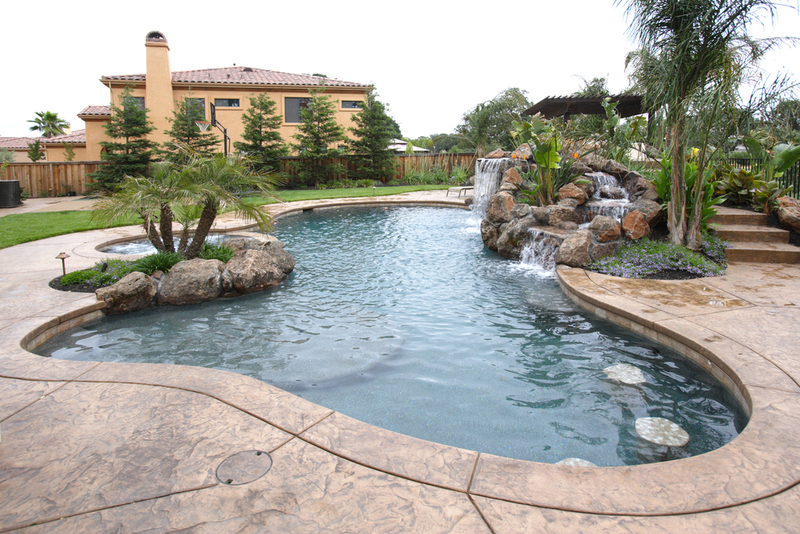 Again, send any summer project ideas my way whenever you can, and I'll start putting things together for the summer. Thanks to everyone who sends an idea in, and thanks just for reading this chatter! The guy to the left? That's New Jersey Devils owner Jeff Vanderbeek. He's the guy who bought out his minority partners in January to obtain sole ownership of the New Jersey Devils and the Prudential Center arena. He's also the guy who signed Ilya Kovalchuk for all of the tea in China, but that's his money and he can do with it as he pleases. However, it seems that the New York Post's Josh Kosman knows more about Vanderbeek's wealth - or lack thereof - than the rest of the world does. I caught this story lurking on the depths of Twitter. Kosman reports that "[t]he New Jersey Devils are again skating on very thin financial ice" after Vanderbeek had obtained a restructured loan to pay down the mounting debts facing the franchise and arena. According to Kosman, Vanderbeek "missed an interest payment" in April "and now risks defaulting" on the loan. The moment I read that, something began to smell a little off. Having worked in the financial industry for some time, I can tell you that missing a payment of nearly $3 million wouldn't slide under the radar in April only to be discovered in June by a newspaper reporter. No, payments missed of that nature are usually discovered pretty quickly, and banks are notorious for ensuring they get their money, I've heard. So having a payment missed and not made for nearly two months? Unlikely, but more on this below. Secondly, referencing the 113-day lockout is fine as it certainly wouldn't help in bringing in money when you consider lost ticket sales, parking and concession revenues, and sponsorship monies. But it also doesn't factor in savings such as not paying players, not putting ice in for 113 days, and not having to have concession, parking, cleaning, and other staff at the arena for those 113 days. In short, the lockout's "costs" would be offset by the savings seen in the same situation. Sensationalism in journalism seems to be a New York Post specialty. Thirdly, if the bank wanted to simply put the loan in default, they will never see the value of the money come back to them in any real form. It's $170 million in money they will never realize unless the team and arena are sold to a new investor, and most people with money will recognize this kind of sale as a firesale where the bank simply wants to move an asset to recover its money. In this case, investors bid low since the bank is desperate to sell. But here's the key: in allowing Vanderbeek to be tardy on a $3 million payment while he straightens things out with the NHL, the city of Newark, and anyone else he's approached for a monetary solution, the lenders are wise to keep their yaps shut to the press in order to keep everyone's houses in order. 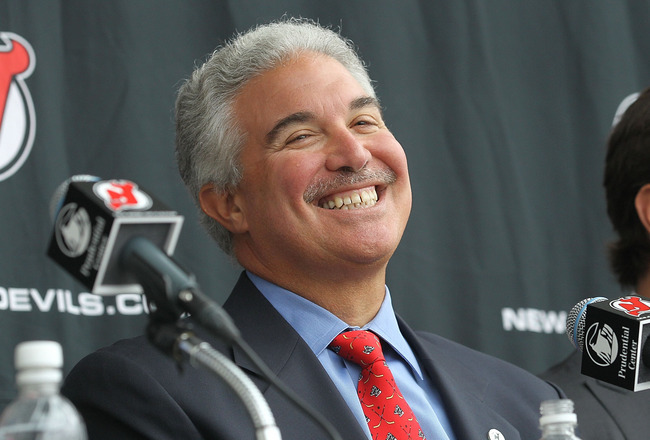 The Devils and the city of Newark just reached an agreement that will bring in some solid revenue for at least the next five years. The parking agreement alone is worth $2.7 million annually - just short of the $3 million payment owed. You don't think that money will offset any of the interest payments that Vanderbeek owes his lenders? It's not like Vanderbeek is sticking it to the people of Newark and his lenders. You can't tell me that you've never put off paying a bill when there are more pressing needs that require your financial attention. We've all done it, and that's what Vanderbeek is doing here. He needs his hockey people to re-sign talented players and attract new talent for a playoff run next season. He needs to ensure that his facility people are attracting top flight attractions and concerts to ensure that the Prudential Center is hopping. These are things that make money that, in turn, pay bills off faster. The $3 million payment? 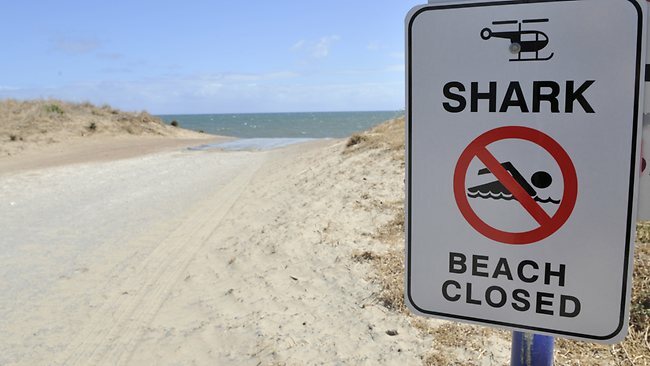 A spit in the ocean when once considers the $170 million still owed to lenders. But to claim a default status would put the entire amount at risk of never being realized. Honestly, this should be a non-story and I'm kind of embarrassed that the New York Post went after this. Some critical thinking would give way to what appears to be happening in Vanderbeek's situation, but it seems that sensationalism sells more papers than proper journalism. While I'm not in the business of calling out journalists often, this is on case where a small blurb and some research could explain a lot. I guess that's outside the normal job description of "New York Post journalist". Of course, I could be way off and Vanderbeek could be swimming in red ink as I write this. It's entirely possible that Kosman is more in tune with Vanderbeek's financial situation than even Vanderbeek is. But I gather that Vanderbeek's a pretty astute businessman who knows the value of a dollar and how to make that dollar grow into many dollars, so I just can't see a New York Post journalist knowing more about the owner's finances than the guy writing the cheques. Doesn't make a lot of "cents", does it? I honestly enjoy a good book series when the stories have me captivated. While the Screech Owls series is meant for readers of a younger age, I have to admit that I have enjoyed the three previous stories that started the series. These books are highly recommended for children aged nine to twelve due to their easy-to-read stories and excellent themes. Today, Teebz's Book Club is excited to review the fourth book in the Screech Owls series in Murder at Hockey Camp, written by Roy McGregor and published by McClelland & Stewart. Travis and his friends are all back together for summer hockey camp, and Sarah Cuthbertson has joined the crew at the camp! With the team back together, the boys and girls are separated into their own camps for sleeping, but they all hit the ice together in this fourth installment of the Screech Owls series! While it appears that this might be the best summer ever, one man is apparently intent on making the Screech Owls and Sarah work harder than ever. Buddy O'Reilly, the instructor, can only be described as a tyrant in his teachings, and head coach Muck Munro doesn't like his tactics. Buddy even takes a shine to Wayne "Nish" Nishikawa in the wrong way, humiliating him by making fun of his size. Muck confronts Buddy about his lessons, and the two men come to blows over an argument. Travis has never seen Muck so angry! The kids have a blast learning how to wakeboard and water ski, but Nish has revenge on his mind. After decking Sarah hard in the corner with a hit from behind in following Buddy's teachings, Nish wants to right the wrong he did by taking revenge on Buddy. Travis knows that Nish thrives in this kind of situation, and, before long, Nish his plan. He recruits his cabin mates to help him set Buddy up, but the boys nearly get caught when Buddy's cell phone - which never seems to stop ringing - wakes Buddy up mid-revenge plan! The boys make it back to their cabin without being discovered, and things go quite well the next day with Buddy nowhere to be found. It seems like camp might turn out alright, and things get even better when Sarah invites Travis and Nish to go out for a canoe ride in the evening. However, as Travis is searching for oars in the boathouse, he makes a grisly discovery: Buddy O'Reilly's body! Who could have done this? Was Muck to blame? Was there someone else who could have killed Buddy? Who amongst the campers and staff could have committed murder? Murder at Hockey Camp takes readers on an adventure as the boys become detectives in trying to solve these questions. There is significant evidence that points to Muck, but the boys don't believe he did it despite the police handcuffing Muck and taking him away. 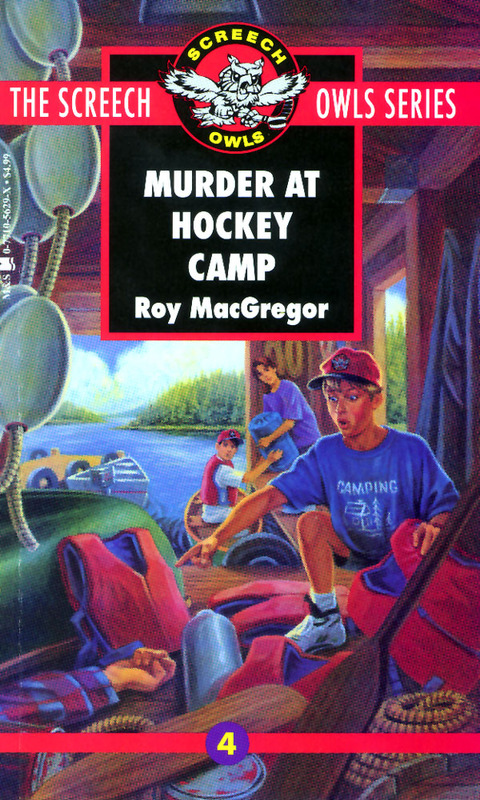 Travis and his friends set out to unravel the mystery of the Murder at Hockey Camp! Like the previous books in the series, Murder at Hockey Camp will keep you flipping pages as you power through the story. Mr. McGregor does an excellent job at holding a reader's attention with his writing, and his murder mystery in Murder at Hockey Camp is fantastic! Because of these factors, Murder at Hockey Camp receives the Teebz's Book Club Seal of Approval to make it four in a row! Look for the Screech Owls series at your local bookstore or library, starting with Mystery at Lake Placid, The Night They Stole the Stanley Cup, The Screech Owls' Northern Adventure, and finally Murder at Hockey Camp! If hockey is in its off-season, you know that changes are coming. Granted, some teams are still playing, but there are very few who are, so most hockey franchises are pushing ahead with business as usual. Today, we'll take a look at more uniform changes, including one uniform change that involves a new city. In other words, it's just another ordinary summer for hockey. The WHL's Lethbridge Hurricanes, as you may have heard, were warned by the NHL's Washington Capitals to change their uniforms due to the Lehtbridge Hurricanes looking quite a bit like the Washington Capitals. Granted, they do look quite a bit alike, but there's no denying that the Lethbridge Hurricanes and Washington Capitals run in different circles. Either way, though, Washington is looking to protect its branding, and I get that side of it. Lethbridge has now come up with a new look, and it feels more like the branding on a grocery store or restaurant than it does a major junior hockey team. Is that a new Hardees logo? While the swoop at the bottom will interpretively imply the Hurricane portion of the team's name, I'm not certain that this logo will stand the test of time. In fact, I'm pretty sure that the logo and uniform used by Lethbridge on their alternate jersey is already infinitely better. said, it appears the logo will change depending on where the Hurricanes are playing. Home will feature the red logo above while road jerseys in red will have the blue logo to the right. Are there any other teams that swap the colors of their logo based on where they are playing? I can't think of any at this moment. 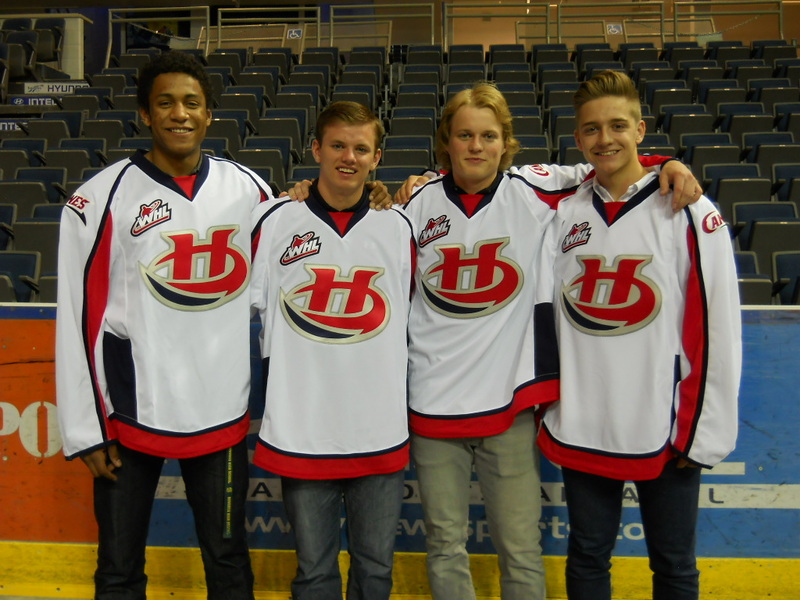 All in all, the WHL's Hurricanes just got a little more generic with these changes. 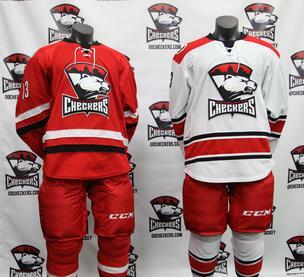 With the news that the Carolina Hurricanes had changed their look last week, their AHL affiliate followed suit this week as the Charlotte Checkers debuted new uniforms. The one thing that never made much sense on the Checkers' uniforms was the tropical storm warning flag stripe on all three jerseys, but, like the Hurricanes, the Checkers will see a significant change. The Checkers will look quite good in their new uniforms. Yes, they are very similar to what Carolina did with their new uniforms, but the major difference is the addition of the black stripe to hit on the key color elements of the Checkers' logo. The additional black also helps to add some contract to the lighter red and white, so the addition of this stripe, even in black, gets a thumbs-up from me. The use of black as a contrasting color is well-executed on the new Charlotte uniforms. Other than that, nothing else is significantly different than what the Hurricanes debuted last week, but the changes are significant compared to what the Checkers wore last season. But for the middle-of-the-road grade I gave to Carolina, Charlotte gets things right with the contrasting stripes. Thumbs-up from me. With Vancouver having abandoned their AHL affiliate in the Chicago Wolves and purchasing the Peoria Rivermen as their affiliate, you knew things were changing already with the Canucks franchise. With Peoria announcing it was returning to the SPHL as the Rivermen, you also knew that the Canucks were shopping their affiliate to potential cities. We found out where they landed yesterday as the Utica Comets were officially introduced to the world. The rather soccer-esque shield used by the Comets is rather uninspiring to say the least. Does Utica have anything to do with space or comets? This rather uninspired name is right from the a list of classic generic team names on might find on EA Sports' NHL '14 when creating your own team. Needless to say, the logo itself is even worse than the generic name considering that it says nothing about the city and has no history itself o drawn upon in terms of justifying the team name. Pretty poor effort from the Canucks, if you ask me. However, the Canucks laid everything out via their website as to how Utica's newest AHL team go its name: "The brand development for the Utica Comets was taken on by a secret task force within the Vancouver Canucks organization. Their objective was to create an identifying mark/brand that is timeless, strong and practical. A classic hockey logo and jersey design, with a modern take, that honours the Comets heritage, hockey, the city of Utica, New York and draws a connection to the Vancouver Canucks, is the result." Um, what? Well, apparently the name comes from the Clinton Comets, a very famous team in the EHL, that worked 10 miles away from Utica in Clinton, NY. The Comets put together some amazing seasons in the EHL, including the 1967-68 Comets team that dominated in going 57-5-10 in that season. Needless to say, the Comets are the most famous team from the Utica area. 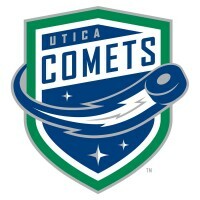 Vancouver, in looking at Utica's history, decided that it was fine to absorb the history of the Clinton Comets since no one else was using it. The funny thing is that none of that history came in Utica whatsoever. They were and still are two distinct cities that are 10 miles from one another. This would be like the New York Islanders absorbing all of the Brooklyn Americans' history simply because they are moving to Brooklyn! I can't tell you how much this annoys me, but know that I am annoyed. Greatly. Enraged even. The team will resemble the Canucks in terms of what they wear on the ice. Nothing magical or unique here, but I will say that the logo on the uniform looks much nicer than it did up above in the graphical version. That fact alone won't redeem Vancouver in stealing another team's history to use as their own, but at least it appears they'll look respectable while living a lie. Vancouver had reportedly wanted their own AHL franchise to move closer to them - aka move to Abbotsford, BC - but with the Flames locked into their contract with Abbotsford for a while yet, it appear that Utica will be the temporary home for the Comets until the Flames can come to some sort of agreement to move the Heat elsewhere. Once the Flames have vacated Vancouver's backyard, I expect the Abootsford Comets to be a reality. After all, Utica to Vancouver is only 2295 miles... or about 523 miles less than Chicago. All that for a poorly-named AHL affiliate who stole the history of another team, all while wanting to cut costs on a team-owned affiliate until they could move out west? Wow. Well done, Canucks! Excuse the sarcasm. Now some may say "Teebz, they only had a couple of months to get this ready" or "Teebz, the Clinton Comets moved to Utica in 1972" or whatever. First, don't rush the branding on a team you want success for because teams live and die by their branding. They have also been affiliated with two former IHL teams - Winnipeg and Chicago - where the AHL affiliate had some autonomy on signing veteran AHL talent. In other words, Vancouver couldn't just stock their roster with their own talent because those AHL teams could add some talent if they felt it necessary. That had to stick in Vancouver's craw at some points because their young guys wouldn't necessarily be playing all the time. Thus, their own affiliate was necessary, and they went out and got it. Secondly, I don't care if the Comets moved - the histories are entirely separate. The Winnipeg Jets today do not get to absorb the Jets' history from the past. They are entirely different franchises. No ifs, ands, or buts about that - history follows a timeline. Teams can rebrand as the old team name, but absorbing the history of something one didn't do makes for very complicated problems when explaining the history of the Comets team. Thirdly, Utica has been trumpeting their city for some time as a proper AHL destination for a franchise, and they have approached a few not-so-solid teams with some sweetheart offers. Vancouver's affiliation with Chicago was solid, but the Canucks most likely wanted more say over the operation of the affiliate, so they got one available in Peoria and needed to move it. The planning for this had to have been well over a year out, so the fact that they rushed the move, and the name with it, makes no sense. I get how the timeline works, but they didn't need to make an announcement in June when they had until September. Regardless, I expect this Comets franchise to be in Abbotsford at some point in the future. Sorry to inform you of your pawn status, Utica, but you may want to ready yourself for an invasion of Heat in the future. Expect more changes as the summer pushes on. Rumor has it that the Islanders may be looking to do something with their move to Brooklyn, so keep your ear to the ground on that one. If anything else happens, though, I'll have it here! There are always a few eyebrows-raising choices made when the NHL Award winners are announced, but I'm pretty sure that the writers who had access to the ballots this year lost their minds at some point. As news filtered out from the NHL and various media outlets that the award-winners had already been selected and would be announced, there were almost immediate leaks about who won which award. Some are deserving and I accept that, but others are completely baffling as to how the writers determined that those players should win. CALDER TROPHY - JONATHAN HUBERDEAU: I don't have a problem with Huberdeau winning the Calder. Having seen him destroy the Jets on various occasions over the season, he always played at a consistently high level, and was near the top or leading most rookie categories. While Brendan Gallagher and Brandon Saad had exceptional seasons as well, the fact that Huberdeau played on a horrific Panthers team at a high level pushes him to the top for me. VEZINA TROPHY - SERGEI BOBROVSKY: Undoubtedly, this award was won by Bobrovsky. For the second half of the season when it appeared the Columbus Blue Jackets might be dead-man walking again, Bobrovsky put his team on his back and almost single-handedly willed them into the playoffs. He was 21-11-6, had a 2.00 GAA, and a .932 save percentage on a team that missed the playoffs. He appeared in every game during the Jackets' franchise best 12-game point streak (8-0-4). Compared to Henrik Lundqvist and Antti Niemi, Bobrovsky just did more with less in putting up those numbers. SELKE TROPHY - JONATHAN TOEWS: I originally had this award below, but I came to realize that I splitting hairs. Toews does yeoman's work in playing against the opposition's top line and still is near the top of Blackhawks' scoring. He's their leader and captain, and certainly has sacrificed his own personal stats for the betterment of the team. His +28 plus/minus shows that goals are being scored for the Blackhawks and not against the Blackhawks when he's on the ice. While I could have made a case for Boston's Patrice Bergeron (and almost did), Toews was second-best at winning face-offs behind Bergeron. Had Bergeron not missed time with a concussion, this award may be his. JACK ADAMS TROPHY - PAUL MACLEAN: Roster decimated by injuries to his top players? Check. Consistently high level of play despite the injuries? Check. Look, let's cut to the chase here: if you lost Erik Karlsson and Jason Spezza early in the season, you might be forgiven if you wrote the season off as coach. If that wasn't enough, losing your bonafide starting goalie should put you in panic mode. But not Senators coach Paul MacLean. Ottawa finished just seven points behind division-winner Montreal. He got more out of Kyle Turris than any coach before him as Turris led the Senators in scoring. He found rookies willing to do anything to win. He got double-digit point totals out of Chris Phillips, Marc Methot, and Andre Benoit. And all of it was done in front of two rookie goalies who played in half the games. Paul MacLean absolutely deserved this award over Joel Quenneville and Bruce Boudreau by keeping Ottawa as a playoff-bound team. BILL MASTERTON TROPHY - JOSH HARDING: It hard not to feel good about Josh Harding's continuing battle against multiple sclerosis. Sure, he only played five games because of treatments necessary for the disease, but Harding's refusal to use it as a crutch is more impressive than anything else. He was determined to return to the ice and did, but his work in the playoff showed that not only was he determined to return at a high level, but he stepped into the most intense battle the Wild faced this season and stared down the Blackhawks. His stats - 2.94 GAA and .911 - are pretty darn good for a guy who played only five games this season. While the playoffs aren't recognized as part of the awards-voting process, you had to know that Harding's return alone was more deserving of this award after staring down his most personal battle. LADY BYNG TROPHY - MARTIN ST. LOUIS: St. Louis led the league in scoring and only made seven trips to the penalty box through 48 games. It's his third Lady Byng Award, but the first time he has won it and the Art Ross in the same year. Being that he led the league in scoring also means he was on the ice a lot, there's also a great chance at him taking a penalty if he's skating more often. This one, based on those truths alone, would make St. Louis a logical winner. NORRIS TROPHY - PK SUBBAN: I get that PK Subban had a big year, but giving him this award is a farce. PK Subban and Kris Letang tied in points, but Subban played seven more games. So it wasn't even like he was the best offensive defenceman in the league. Letang ha a better plus/minus, showing he's better in five-on-five situations. Letang took less penalties - 49 minutes less - than Subban. Letnag played more minutes per game than Subban. So why am I picking Ryan Suter? He is the best defenceman this season both offensively and defensively. Third in points by a defenceman. Most ice-time. Most shifts. More powerplay goals than Letang. Played in system that has heavy emphasis on defence while still finishing third among defenceman scoring. I would have had Ryan Suter as my pick, followed by Letang and then Subban. Had Subban's teammate Andrei Markov not been a -9 this season, he'd have been picked above Subban too. Ovechkin is one of the players who has performed significantly better against non-playoff teams, scoring 1.35 points-per-game against them and just 0.69 points-per-game against playoff teams. Ovechkin has scored a whopping 22 goals in 26 games against non-playoff opponents, which is staggering. He’s scored at least 3 goals against every non-playoff team this season except for the Philadelphia Flyers. The playoff team he’s performed the best against? The Pittsburgh Penguins, with 4 points in 3 games. I’ve heard all three of Ovechkin, Kane, and Tavares mentioned in the Hart conversation. The fact that the bulk of their points have come against non-playoff teams might call into question their candidacy, particularly compared to someone like Crosby, who has performed consistently against all competition this season, even scoring slightly more against playoff teams. I will say this, though: congratulations to all the NHL Award winners. You had to have played at a high level this season in order to sway the voting masses to pick you as their winners. If you haven't been tuning into The Hockey Show at 5:30pm CT over the last couple of weeks, you've missed out on half the show on those days. That's ok, though, because you can get the podcasts here! In any case, Beans and I are totally pumped for today's show as we welcome two guests to the show! No, The Hockey Show isn't going to be talking about weddings a lot tonight. But we do want to speak with the two models in this photograph: Brandon Reid and Jessica Scott-Reid! Brandon is former Manitoba Moose winger who had a cup of coffee with the Vancouver Canucks before plying his trade in Germany and Switzerland. Jessica is a Winnipegger who is a freelance journalist as she and Brandon explore the four corners of the planet in an effort to play hockey. Needless to say, their story should be very interesting, and you already know that Beans and I like to have a little fun. I am pumped for the interview! We'll try to take some calls so you can speak with Brandon and Jessica as well. Please call us at (204) 269-UMFM (8636) with your questions, and we'll do our best to get you on. If you'd like, you can always tweet me at @TeebzHBIC with comments and questions and I'll do my best to get them on the air. Hopefully you'll tune in on 101.5 UMFM at 5:30pm CT! Brandon and Jessica have a fantastic hockey story to tell, and we'll get them on the air to talk about their lives that are intertwined with hockey! I had stated in the last Teebz's Book Club review that I was addicted to the Screech Owls series. The stories are well-written and intelligent, and I find myself unable to put the books down when I have one in my hands. 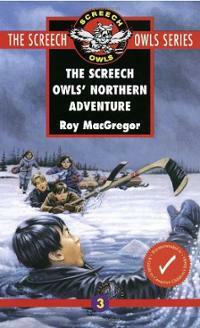 Today was no different as Teebz's Book Club is proud to present The Screech Owls' Northern Adventure, written by Roy McGregor and published by McClelland & Stewart. The characters from The Night They Stole the Stanley Cup are all back, but we meet new friends in this book as the Screech Owls head north for a tournament. Of course, we discover all new problems and situations that the team members have to work through, so another adventure awaits readers in The Screech Owls' Northern Adventure! From the ScreechOwls Online website, Roy MacGregor has been involved in hockey all his life while growing up in Huntsville, Ontario. He competed for several years against a kid named Bobby Orr who was playing in nearby Parry Sound. He worked as a columnist for the Ottawa Citizen and is now a senior columnist for the National Post. 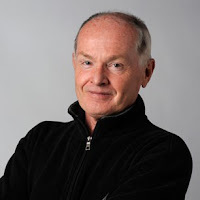 He has written several classic hockey stories, including Home Game (written with Ken Dryden) and The Home Team, and many hockey books for younger readers such as A Loonie for Luck. 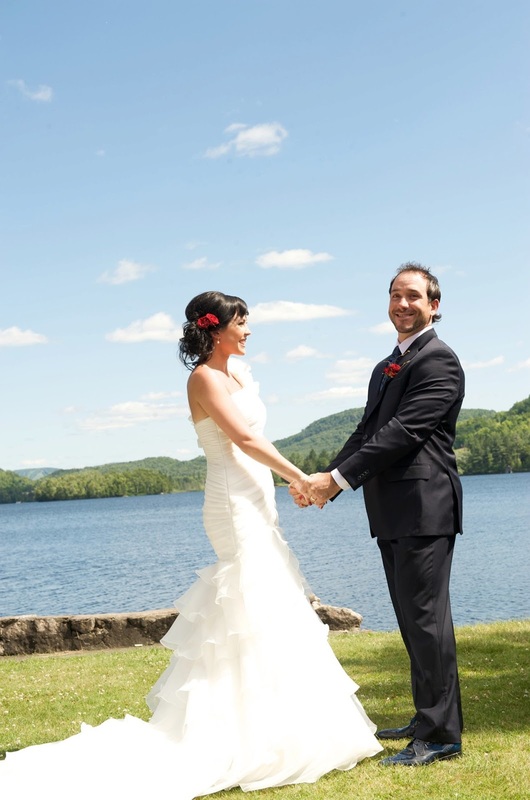 He and his wife, Ellen, live in Kanata, Ontario. They have four children, Kerry, Christine, Jocelyn, and Gordon. He still plays old-timers hockey and has been a minor-hockey coach for more than a decade. The team finds itself on a bumpy airplane trip as the book opens. Jesse Highboy's father asked the team if they'd like to visit Waskaganish on the coast of James Bay to play in the First Nations Pee Wee Hockey Tournament, and the team heartily accepted the offer! Life, as the urbanized kids soon see, is far different from what they know, and some have a hard time accepting the changes presented to them. Wayne "Nish" Nishikawa seems to be slightly off in this story as he comes off as rude and bigoted towards Jesse's extended family and the people of Waskaganish. Where Nish was goofy before, he was never quite as rude as Mr. McGregor characterizes him as seen in this story. This new character flaw leads to one of the major problems in the story as Nish puts himself, Travis, Jesse, and Rachel Highboy in serious danger. The Screech Owls learn an incredible amount about the people of Waskaganish. From bannock to Ski-Doos to radio communication between camps, the Screech Owls get an education on how life in a northern town functions. And when Nish and his friends run into trouble, Travis realizes that for all they know, they cannot get themselves out of trouble without a little help. Travis had never felt so helpless. If he had been in charge, Nish and he would have turned to ice on the banks of James Bay, their frozen tears proof that they had been bawling like newborn babies right to the bitter end. The Screech Owls' Northern Adventure is an excellent look at how a community rallies around hockey in a place that is entirely different from the luxuries that the Screech Owls seemingly take for granted on a daily basis. Hunting, trapping, and fishing are all required to survive for the people of Waskaganish rather than being sport. Eating food such as brannock and goose is something none of the Screech Owls have ever done, but it's daily life in Waskaganish. The hockey tournament goes well for Travis Lindsay and the Screech Owls, but they find themselves against Rachel Highboy's team, the Wolverines, in the final! Of course, there are no guarantees that the Screech Owls will win any games, so will Travis' team prevail or will they go home earlier than expected? Mr. McGregor really paints a vivid picture of life in Waskaganish, and his work in showing the discomfort of the kids is really well done. Nish's character is nearly racist in his refusal to adapt to any situation presented by the people of Waskaganish, and the lesson regarding tolerance and acceptance comes through very strong in The Screech Owls' Northern Adventure. Because of the lesson presented by Mr. McGregor and because of the excellent descriptions of life near James Bay, The Screech Owls' Northern Adventure deserves the Teebz's Book Club Seal of Approval! Look for the Screech Owls series at your local bookstore or library, starting with Mystery at Lake Placid followed by The Night They Stole the Stanley Cup which is followed by The Screech Owls' Northern Adventure! As we get closer to the awarding of the Stanley Cup to one of Chara or Toews, the pools in these lede photos are getting smaller and smaller as the window of opportunity shrinks on some poolies. Sure, some eliminated themselves by not participating after the first round, but that's their loss and your gain, right? In saying that, there has been some movement in the standings and we have quite a battle on our hands, so let's see what happened after this round. I will say that I'm pretty sure everyone thought the Penguins would give Boston a run for their money in their series because no one called a sweep. Honestly, though, did anyone on the planet call that? The Chicago-Los Angeles series saw one person call a five-game series with Chicago prevailing. More on that entrant below. Needless to say, short series do a number on the total points one can earn in a round. Kudos go out to Brian W. and Greg C. for their twelve-point rounds! Also grabbing some spotlight is Corey D. with his eleven-point round! These three entrants were the only people to score in double-digits in this round, showing just how hard short series are on all poolies. There were two individuals who pulled off extremely impressive totals in this series, and both were mentioned above. Brian W. saw Chicago winning in seven games, but he destroyed this series in calling game-winning goal scorers. Brian correctly predicted the winning team in Games One, Three, Four, and Five for four points, but went on to add the game-winners in Games One (Hossa), Three (Voynov), and Five (Kane). Add another six points to his four earned, and Brian walked away with ten points! The other masked man was the only person who correctly predicted a series in this round. Greg C. called every winning team right for five points, and had Chicago standing as the winning team after five games for another five points. Well done, Greg, on your ten-point series as well! The sweep did a number on scores in this series, but two participants emerged with five points to lead the way. Corey D. called the Bruins as winners in Games One, Three, and Four, and added David Krejci's game-winning goal in Game One for a total of five points! Dan mirrored those same predictions, and he also picked up five points! Well done, Corey and Dan, on leading this series! The top-nine players have shuffled slightly, and there is a massive bunching up of poolies below the leader. Much like the NHL Playoffs, the race to get above the line in the HBIC Playoff Pool will come down to the wire as predictions made in the Stanley Cup Final could have drastic effects on the pool's leaderboard. That being said, here's the top-nine poolies as it stands. If you look at that list, there are ten names on it. If my math skills are up to par, that means one of these ten people will exit the pool at the end of this round with nothing to show for it! Make your predictions wisely, poolies. And consider that Tyler J. is on the outside with 71 points as of right now, awaiting two of you to falter so he may grab a prize! Here is the spreadsheet for the Stanley Cup Final. Same rules, so you know what to do. Please have it sent in by puck drop on Wednesday night's opening game of the Stanley Cup Final! Of course, make sure you send it to the right email address! Best of luck to everyone in the Stanley Cup Final, and here's hoping you'll have the series of the playoffs so you get into the prize group! Having seen some spectacular ball hockey played in Winnipeg recently, I thought it would be appropriate to talk a little about another ball hockey tournament that took place at the Jack Byrne Arena in Torbay, Newfoundland. The 2013 World Ball Hockey Championships wrapped up yesterday, and it was two old foes who squared off in the women's final as Team Canada faced off against Team Slovakia in the championship game! These two teams have some history as Canada and Slovakia have each won two gold medals over the last four tournaments, held every two years. Slovakia had downed Canada in 2011, so the Canadian team was looking for a little revenge after being tops in 2007 and 2009. Clearly, though, the best two teams in recent history were meeting to determine ball hockey supremacy, and the hometown crowd was hoping for a Canadian victory on home soil! Native Newfoundlander and Deer Lake resident Dawn Tulk scored both of Canada's goals for the home squad, and Kristen Cooze of Kippens, Newfoundland assisted on both of Tulk's goals as Canada shut down the Slovakian attack in earning the 2-0 win! 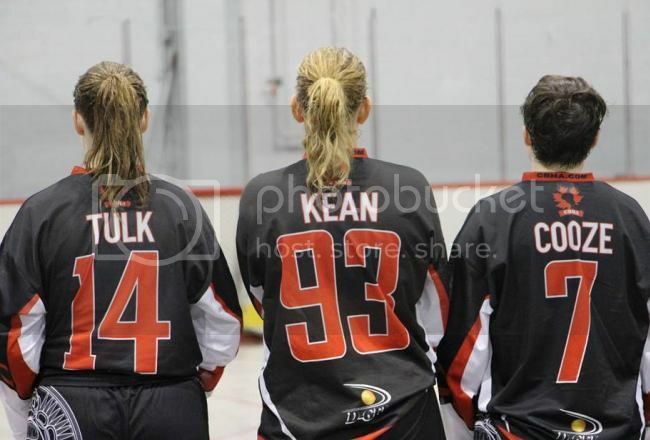 Joining Tulk and Cooze in representing Newfoundland and Labrador was Amanda Kean as the trio helped Canada hoist the 2013 World Ball Hockey Championship Trophy! The game wouldn't be without its stars, though. 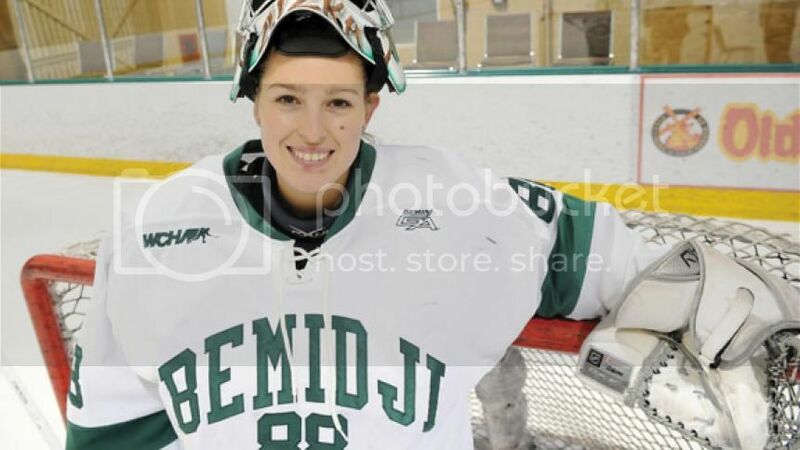 Zuzana Tomcikova wore Slovakian colors as the goaltender for the women's ice hockey team at the 2010 Olympic Games, and she tends nets for the Bemidji State Beavers in the NCAA. However, it was Tulk who showed off her incredible talents as she beat Tomcikova twice in leading Canada to victory! While the Canadian women were soaking up the spotlight with their victory, the Canadian men where trying to fend off questions about a teammate who went absolutely berzerk in the semi-final game they played and, ultimately, lost. Justin Pender, a former Halifax Moosehead and current member of the ECHL's Ontario Reign, came on at the end of the game with just a few seconds remaining for what seemed like a meaningless face-off when it appeared some chirping began between himself and the Czech Republic player he was lining up against for the face-off. I'll let the video explain the rest. I don't know what was said to Pender, but the pointing at the scoreboard by the Czech player clearly sent him into a rage. And it didn't just stop with the Czech player as the Czech goaltender and an official took a physical beating in trying to stop Pender's rage attack. Terry Ryan, Pender's teammate, indicated via Twitter that the Czechs had been "spitting [at] our bench, diving all over floor and laughing at us after every dive", something the Canadian squad found classless. Ryan goes on to say, "I've never seen a team rub it in like that, its not like we did anything dirty out there... / ...the Czechs simply used the whole dive/flop/taunt thing as a tactic. I stand by my guys as a captain...". This was an international event, so fighting is banned, of course. I get where Terry Ryan is coming from in terms of a sportsmanship view, but pummeling an official who needed to be stretched off to the hospital is a little much, no? In any case, Pender's suspension is still under review, but I expect he'll be asked to sit out a long time after raining blows upon two Czechs and an official. The players and officials, I'm guessing, probably don't make very much money from playing in or working these games. To send one man to the hospital while trying to cave in another man's face is simply idiotic. By the way, the Czechs won the gold medal, and Canada throttled Portugal to take the bronze medal. It just doesn't seem like it was worth it, though. 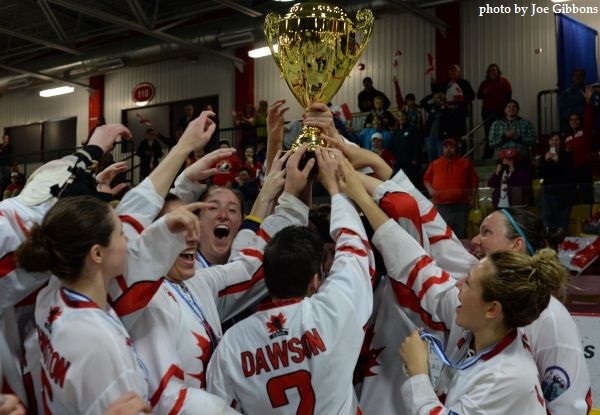 Congratulations to both squads - I think - but a huge applause for the Canadian women for playing within the rules to win a gold medal for Canada! Well done, ladies! As for the men, clean up your act! There isn't a lot to be said for these two captains other than they know how to win. 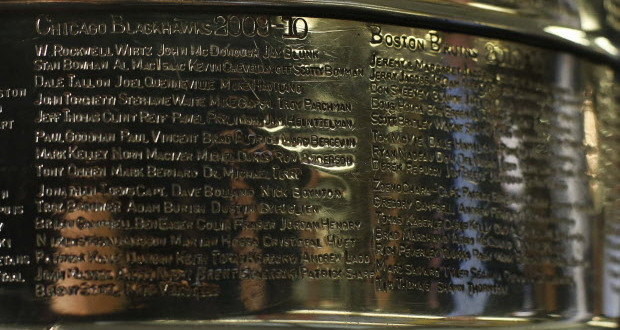 Boston, led by Zdeno Chara, will lead his Bruins into the United Center in Chicago on Wednesday night looking for their second Stanley Cup parade in three years while the Blackhawks, led by Jonathan Toews, will try to capture their second Stanley Cup in four years. Needless to say, these two battle-tested captains will lead their teams into the first Stanley Cup matchup of the these Original Six teams in the game's history with a lot riding on the line. Some have called this series the "Bobby Orr Series". Others have dubbed it the "Classic Rock Series" thanks to the bands Chicago and Boston. The one thing that everyone should call it is a fantastic matchup with intriguing story lines and solid player-vs-player setups. The Bruins hold a 5-1 edge in playoff series over the Blackhawks. The most recent series was in the 1978 quarter-finals where Boston swept the Blackhawks in four games. Boston holds a 261-235-82 regular season record against the Blackhawks as well. This will be the first Original Six Stanley Cup Final since 1979. But none of those numbers matter much in this series. Instead, we'll go with some scary numbers that may tell the tale of who will win the Stanley Cup. 56 - faceoff win percentage by the Boston Bruins. 94.3 - save percentage of Boston's Tuukka Rask thus far. 51 - points scored by Krejci, Horton, and Lucic in 16 games. 21 - years since Jaromir Jagr last appeared in the final. 8 - number of goals scored by new power forward Bryan Bickell. 1 - number of goals scored by Jonathan Toews. 94.8 - penalty-killing percentage by the Chicago Blackhawks. 1.74 - league-leading GAA of Chicago's Corey Crawford. 607 - number of days since Boston defeated Chicago 3-2 in a shootout on October 15, 2011. 10 - consecutive playoff series won by the Blackhawks when having home-ice advantage. Of course, the teams still have to play the games. You just crown a winner based off numbers on paper. If that was done, Pittsburgh and Chicago would be playing, not Boston and Chicago. This should be an epic matchup - one that any and all hockey fans should find something to enjoy. From big hits to timely goals to game-changing saves, this series features two exceptional hockey teams playing incredible hockey. Enjoy the Stanley Cup Final, everyone! I know I will!